Talk about new and improved! Northstar at Tahoe has been renovating non stop to become a first class resort with magnificently groomed slopes, a new village for nightlife fun, and great lodging inside and around the Northstar resort grounds. 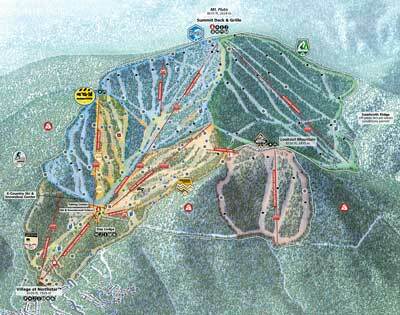 The ski trail maps shows all the new runs added and if you thought this was an intermediate level mountain, not any longer! There are plenty of tough trails so even the advanced skier can get a work out. The new runs are only slightly paled by the new village that has new shops, an ice rink, and lift access right into the middle. This is what a destination resort is all about. You'll have fun on the slopes. When you're planning your vacation to North Tahoe and this resort, you'll want to get your lodging in Northstar at one of the many condominium complexes inside the resort or get home and cabins near Kings Beach or on the other side of the resort in Martis Valley. Martis Valley is closest to old town Truckee, a popular place to dine. Kings beach is well, the beach! Have fun and send us your photos of you skiing. We'll send you some SWAG.